This model is valid CellML but it will not run in OpenCell or COR and it requires much more curation. ABSTRACT: A dynamic computer model of oxidative phosphorylation in oxidative mammalian skeletal muscle was developed. The previously published model of oxidative phosphorylation in isolated skeletal muscle mitochondria was extended by incorporation of the creatine kinase system (creatine kinase plus phosphocreatine/creatine pair), cytosolic proton production/consumption system (proton production/consumption by the creatine kinase-catalysed reaction, efflux/influx of protons), physiological size of the adenine nucleotide pool and some additional minor changes. Theoretical studies performed by means of the extended model demonstrated that the CK system, which allows for large changes in P(i) in relation to isolated mitochondria system, has no significant influence on the kinetic properties of oxidative phosphorylation, as inorganic phosphate only slightly modifies the relationship between the respiration rate and [ADP]. Computer simulations also suggested that the second-order dependence of oxidative phosphorylation on [ADP] proposed in the literature refers only to the ATP synthesis flux, but not to the oxygen consumption flux (the difference between these two fluxes being due to the proton leak). Next, time courses of changes in fluxes and metabolite concentrations during transition between different steady-states were simulated. The model suggests, in accordance with previous theoretical predictions, that activation of oxidative phosphorylation by an increase in [ADP] can (roughly) explain the behaviour of the system only at low work intensities, while at higher work intensities parallel activation of different steps of oxidative phosphorylation is involved. 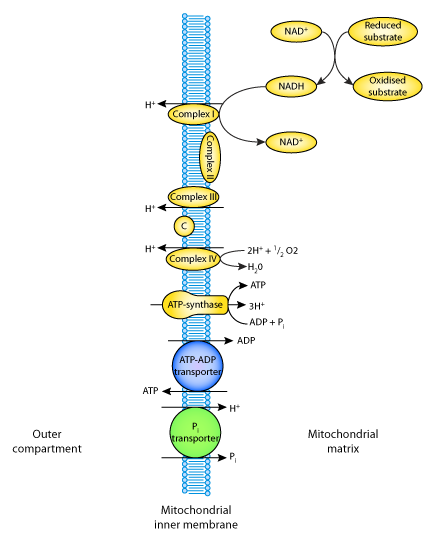 A schematic diagram of the oxidative phosphorylation pathway. Derived from workspace Korzeniewski, Zoladz, 2001 at changeset 7372ab6c2901.